Some outdoor structure designs flow into their intended surroundings effortlessly, without any effort and appear like they were always meant to be. Other designs however, create more of a challenge to appear easy and original to their surroundings. As a seasoned outdoor structure builder I set the bar high. I like for my structures to look as though they belong with the existing home and it’s surroundings. Sometimes in order to do something creative it takes more of a professional eye in order to overcome unanticipated obstacles that may present themselves. At this home in the Steiner Ranch community, we ran into one such obstacle and we were able to come up with a simple solution to a somewhat complex challenge. When we met with the Steiner Ranch homeowners they wanted to add an aesthetically pleasing and weather friendly area to their existing concrete slab patio . Their wish was to transform their slab concrete patio into an outdoor area they and their family could use to relax and entertain. 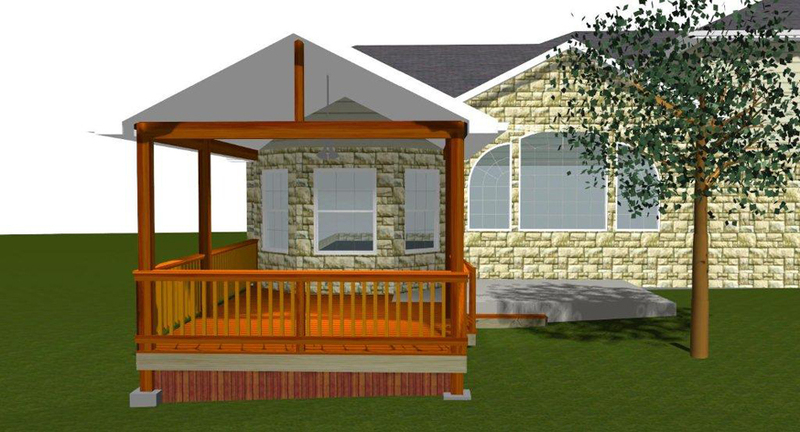 The space intended for the proposed patio cover contained a bay window which created a structural challenge to overcome. The bay window and the area surrounding the bay window left no obvious place to attach the covered patio. Our goal was to attach the roof of the structure at the easiest place on the house that would stay true to the homes structural integrity. Thus, we extended the kitchen window out and put a gable roof over the top. We then used a standard gable extension off the roof to attach the covered patio in it’s destined location. We used mixed mediums of beautiful, rich cedar along with aluminum for the railing. 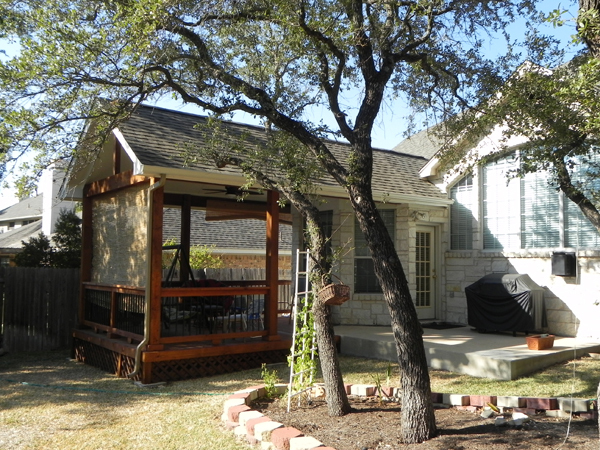 We were able to construct a patio cover for these Steiner Ranch homeowners using the elevation of the original existing concrete patio, which not only keeps the homes originality intact it creates good movement on the covered patio as well. The homeowners are ecstatic about their new outdoor living space, now it has become a treasured space to spend time together. Contact Archadeck of Austin to design your perfect outdoor structure. We can create a unique resolve to your structural obstacles delivering to you an outdoor structure that fits your home and your lifestyle. See more before and after images by visiting our photo galleries located on our website. You can also view more photos of stunning patio designs in our Patio photo galleries, also located on our website. This entry was posted on October 17, 2011 by austinporchandpatio. It was filed under Austin patio cover, Covered patio Austin, Covered Patios, Patios, Western red cedar, What makes for a good contractor? and was tagged with Archadeck of Austin, Austin covered patio, Austin covered patio deck, Austin outdoor room, Austin patio builder, Custom design rendering, Design solutions for structural insufficiencies Austin TX, Project planning, Steiner Rach outdoor living, Steiner Rach patio builder, Steiner Ranch, Steiner Ranch covered patios, Steiner Ranch patio covered.